I’m taking a somewhat wayward look at summer reading today for those of you inclined towards nonfiction. I’m more of a fiction person myself, but do sometimes venture beyond the purely imaginative. Today is one of those days. You may know Aziz Ansari from his unforgettable role as Tom Haverford on Parks and Recreation, his other television and film acting, or his years as a veteran standup comedian. He now adds a new notch in his funny belt as he finds his way into authorhood with his first book, which was co-written with experienced author Eric Klinenberg of New York University, a Professor of Sociology and the Director of the Institute for Public Knowledge. It is a combination of humorous impressions and serious interpretations of the world of love. 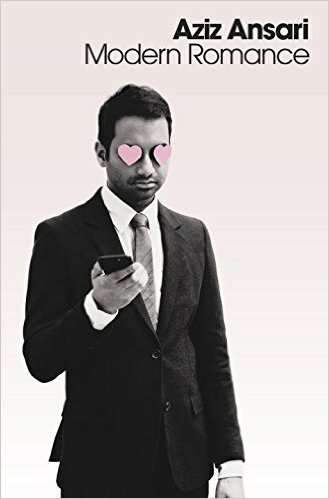 Like much of Ansari’s comedy, this book takes an hilarious look at contemporary relationships, everything from searching for a soulmate to settling down. It incorporates the effect of technology on the shaping of our relationships and also the differences between courtships of the past and present. You may be wondering what Klinenberg has to do with this. Well, he adds a scholarly bent and supportive data. Together the two men designed a large scale, worldwide research project, analyzed behavioral data and surveys, and created an active online research forum on Reddit. They even enlisted the world’s leading social scientists, including Andrew Cherlin, Eli Finkel, Helen Fisher, Sheena Iyengar, Barry Schwartz, Sherry Turkle, and Robb Willer. The insights gathered from this research informs the text. I don’t know how much impact this book will have on serious scholarship, but it certainly puts the fun in fundamentals of dating. This entry was posted in around the library, summer reading and tagged books, summer reading. Bookmark the permalink.